When we first visited Tulum, Mexico in 2005, we stayed in huts on the beach with no electricity. We loved it from the beginning, as we noted in our first post. Now, on our 10th trip, we talked to the front desk of our hotel (Maria del Mar) via WhatsApp, and we could have paid for our fabulous dinner at the Kitchen Table restaurant with Bitcoin. 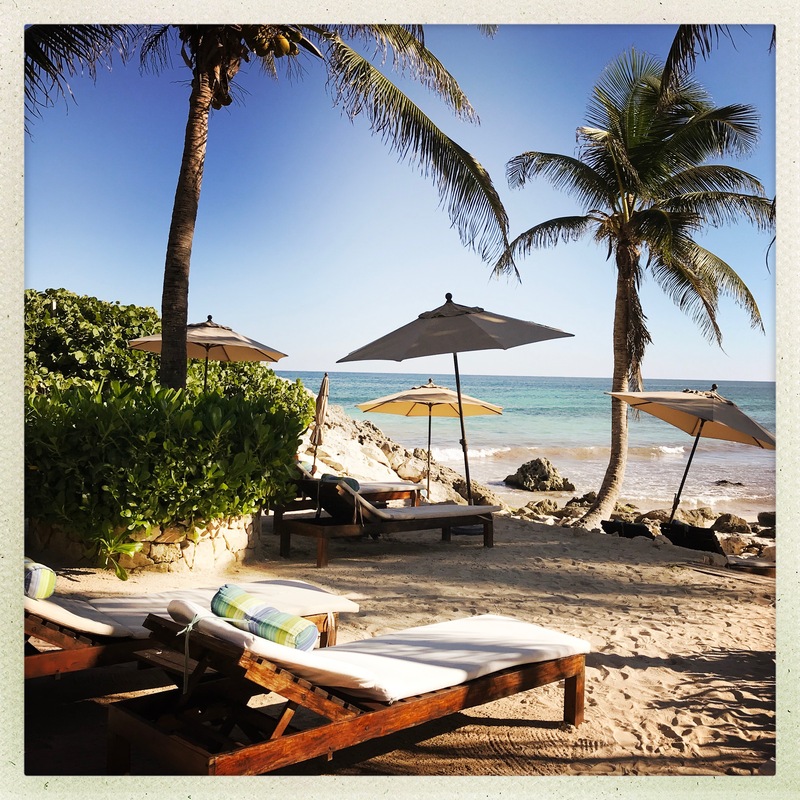 Tulum still has the rustic simplicity we loved on our first visit, but it has a new layer of luxury and sophistication if you want it. 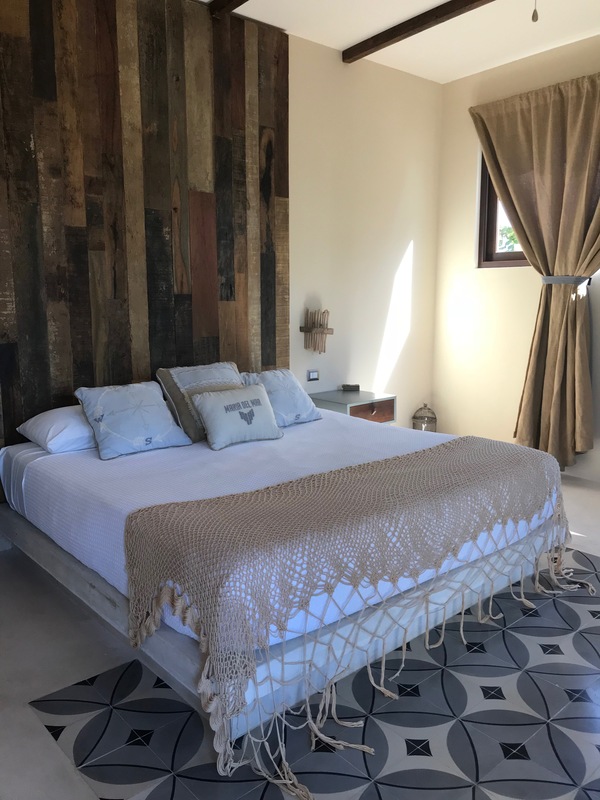 For us, the Piedra Escondida boutique hotel is like a second home: it’s ideally located on the beach road that runs along the Yucatan coast, it’s close to great eating and shopping, and it gives us easy access to Tulum Pueblo and the ruins. 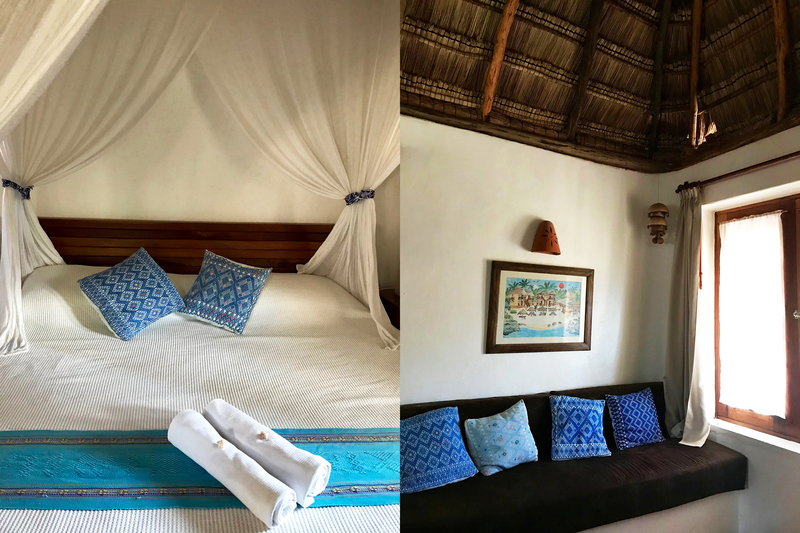 This year, because we booked late, Piedra Escondida wasn’t available for our full stay, so we tried Maria del Mar, the new and very inviting hotel that shares the same quiet cove. 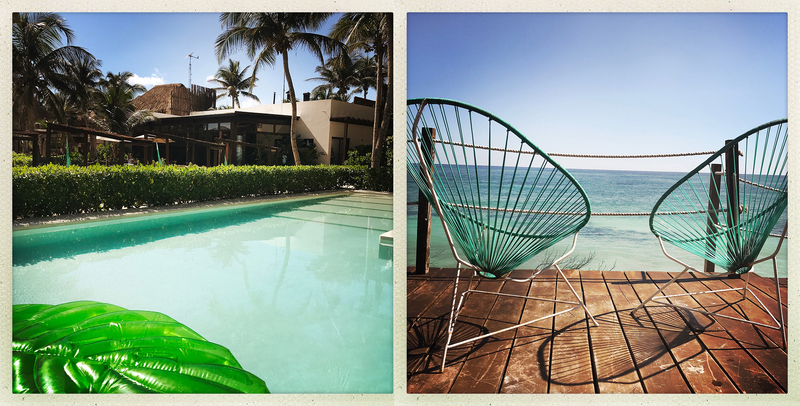 When we visited Tulum last year, we were intrigued to discover this stylish new boutique hotel, with a lovely swimming pool– a rarity among the small hotels along Tulum’s beach. The hotels are just steps from one another, making for a very easy transfer between them, and we very much enjoyed experiencing both hotels during Thanksgiving week. 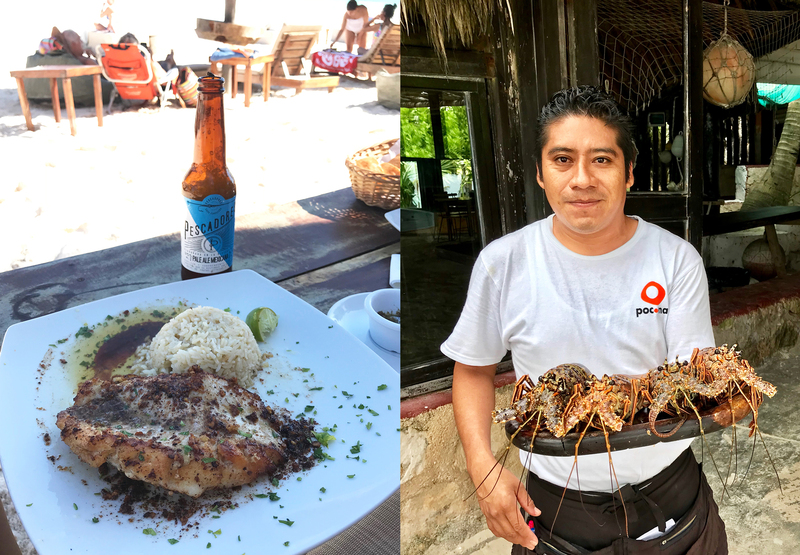 We love the warm welcome of the staff, the stylish simplicity of the rooms, and marvelous food at Piedra Escondida. We enjoy seeing Andrea, Nayeli, Amelio, and so many other familiar faces year after year. 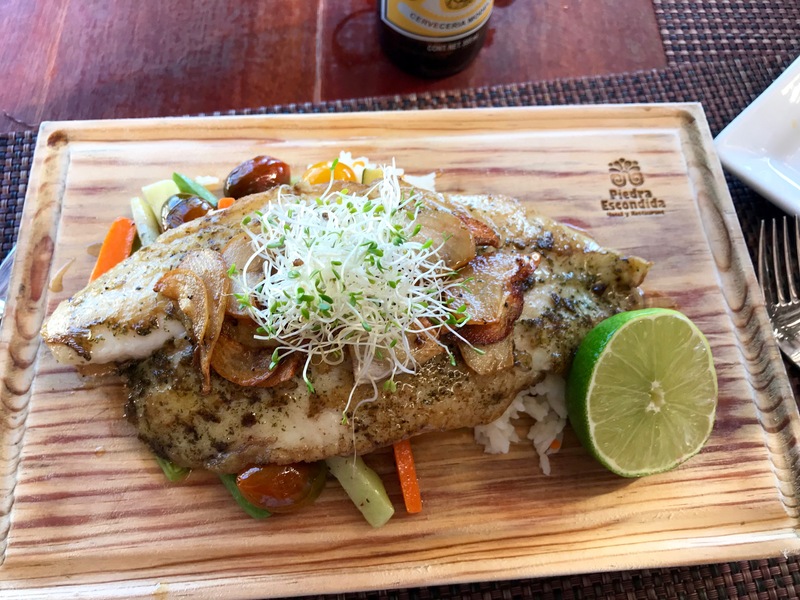 We always order the grilled fish with roasted garlic several times during our stay because it’s that good. 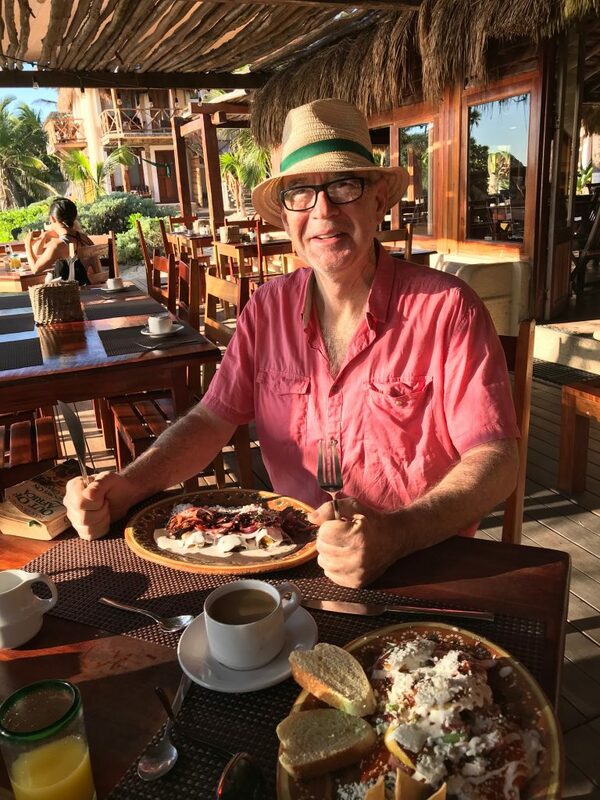 We appreciate the hearty breakfasts, especially the Yucatan and Veracruz style egg dishes, which are included with the room. 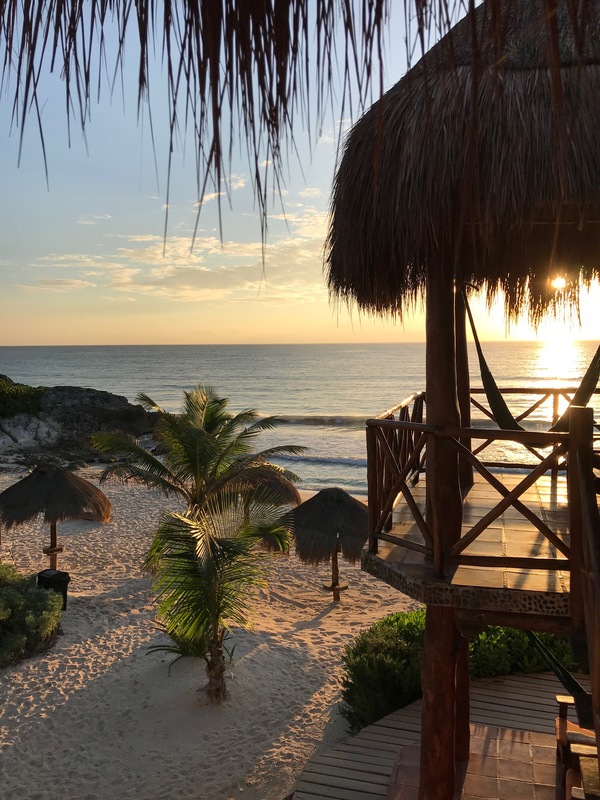 Watching the sunrise from the beach at Piedra Escondida is something we treasure year after year, and we always appreciate the hotel’s rustic yet very stylish decor. 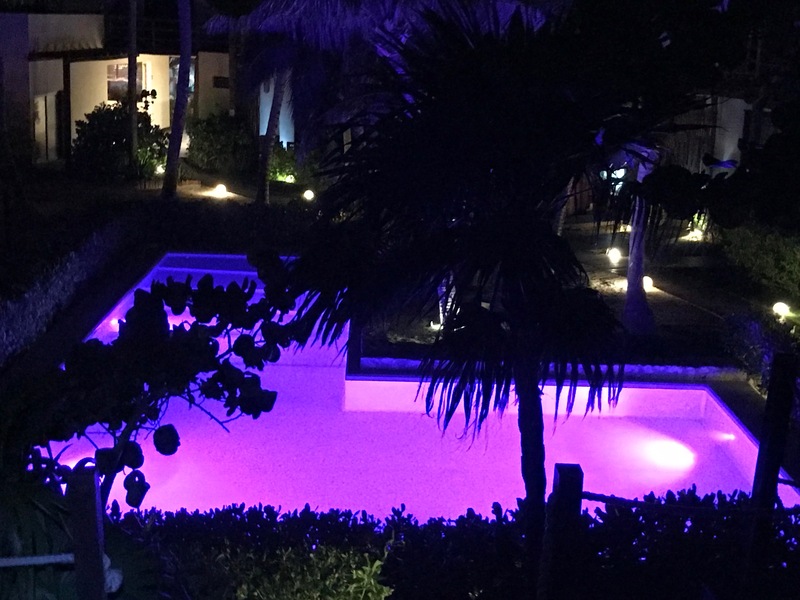 We loved our first stay at this beautiful new boutique hotel, especially dozing on the beach beds, floating in the pool, and stargazing on the beautifully landscaped deck overlooking the sea. The large rooms are stylishly appointed with high ceilings and spacious bathrooms. Our room had a private terrace facing the pool. 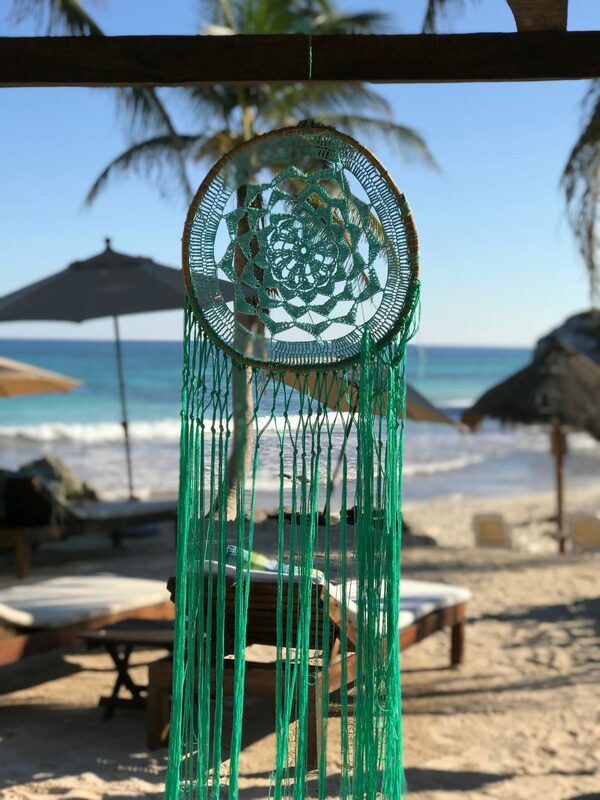 A day— or three— passes so quickly staring up at their dreamcatchers swaying in the breeze, feasting on delicious ceviche and fish tacos from the Mina restaurant, and swaying in their hammocks overlooking the sea. They have a nice selection of fiberglass and inflatable SUP boards at Sian Kite, on the beach at the Papaya Playa Project Beach Club. We have our own SUP boards in Florida, so we’re always curious to try out new boards. I fell in love with a light and fast inflatable board, renting it twice to ride the gentle turquoise waves. It has been much breezier in past years, but we lucked out this year with gentle surf perfect for Stand Up Paddling (SUP). The very laid back crew at Sian Kite was excited that kite surfing season was starting soon, and they also offer SUP Yoga. 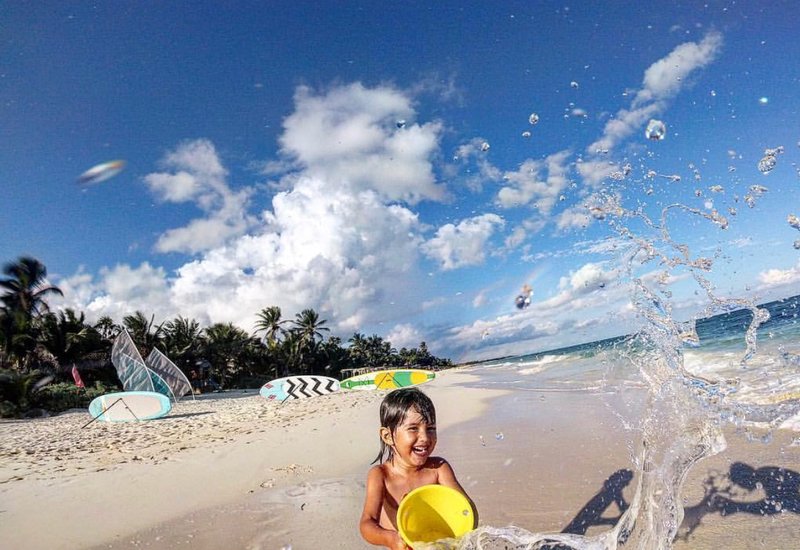 We had a great morning paddle and stayed for lunch at the Papaya Playa Beach Project. 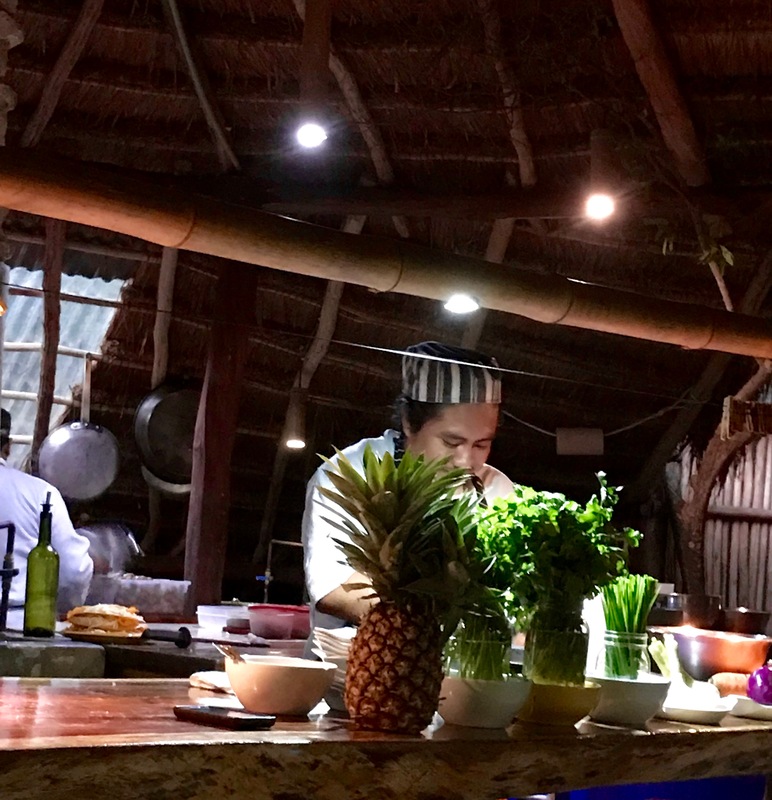 The chef and staff at Kitchen Table work wonders in a jungle-side, open air palapa where we enjoyed very healthy and delicious fare. We started with the deviled avocado and excellent cuitlacoche quesadilla, before moving on to the pan roasted octopus and Umami Tofu Steak, the most flavorful tofu dish we’ve eaten outside of Japan. Our table provided a ring-side seat to the chefs in action, giving us a look at so many beautifully prepared dishes made from locally-sourced fish, meat, and vegetables. Make a reservation for their 6pm or 9pm seating to insure you don’t miss out on Kitchen Table’s wonderful dining experience. 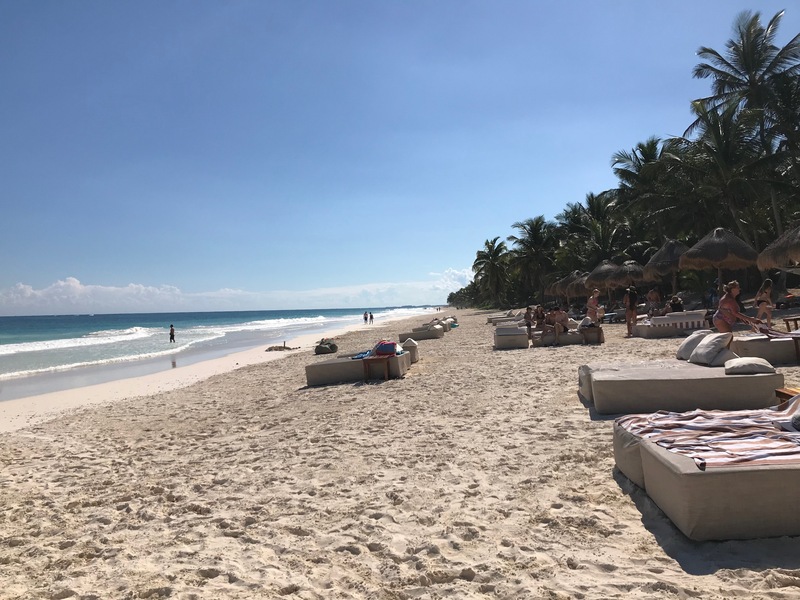 We always rent bikes more than once in Tulum, exploring in both directions along the beach road, and checking out what is new in Tulum Pueblo. Jim enjoys a cerveza frio while I shop at Km 33 and some of the stylish boutiques surrounding it, then we randomly select a hotel new to us, to stop in for lunch and a swim. Renting bikes allows us to cruise along the beach road and discover hotels along the beach. We loved our lunch and swim at Poc Na, which we knew and loved in past years as the Italian-owned hotel Vita e Bella. 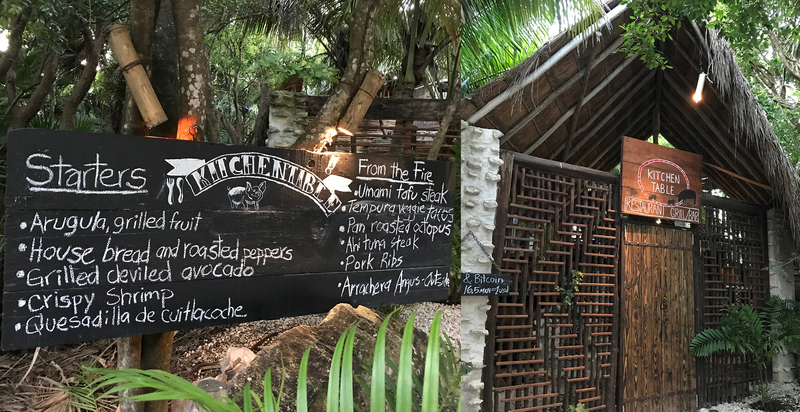 Poc Na, now under Mexican ownership, has a delicious menu, as does, Rosa del Viento, which we discovered another day, biking in the other direction on the beach road. 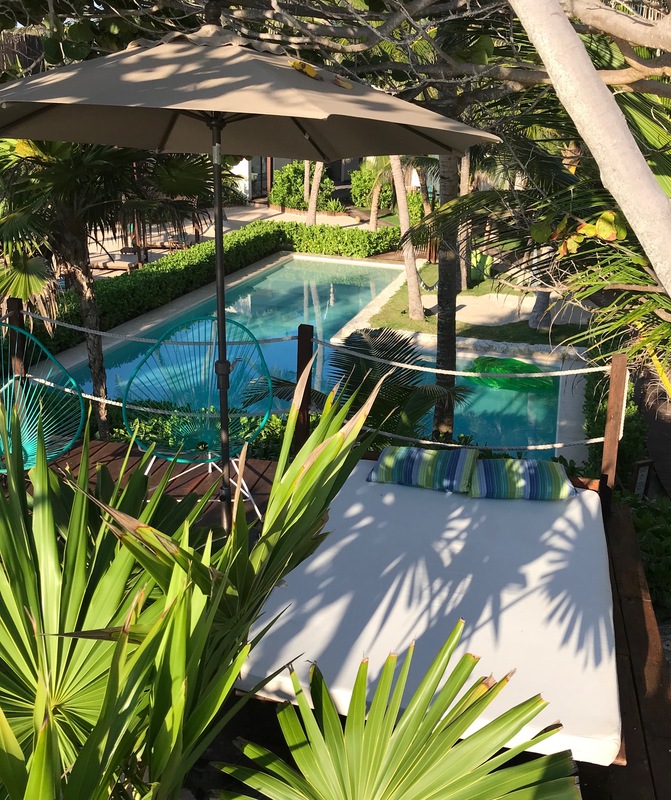 I enjoyed perusing the group of stylish new boutiques for fashion and jewelry, including some made-in-Tulum fashion, that have cropped up at the entrance to Maria del Mar. 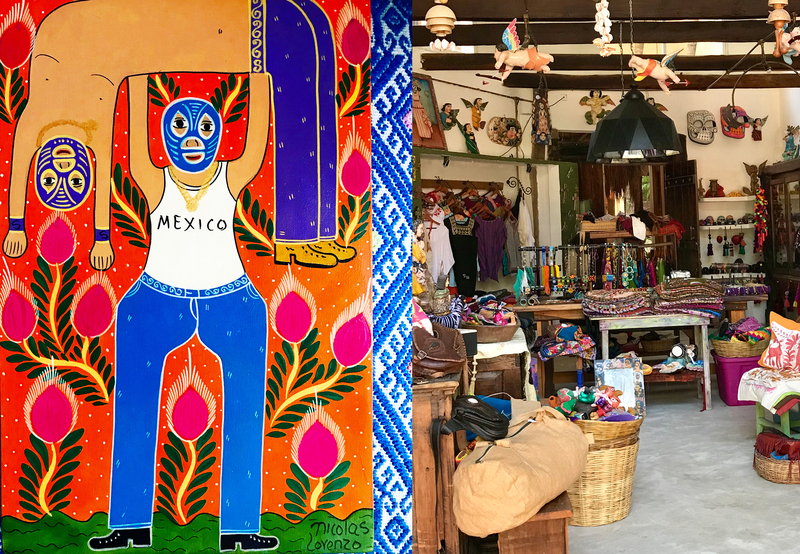 But what usually fills our suitcase, year and after, is Mexican handicrafts from Mixik and Posada del Sol, from painted tin holiday ornaments to jewelry and small art works. Our Thanksgiving feast this year was sharing a freshly caught Red Snapper at this outdoor restaurant we return to again and again. 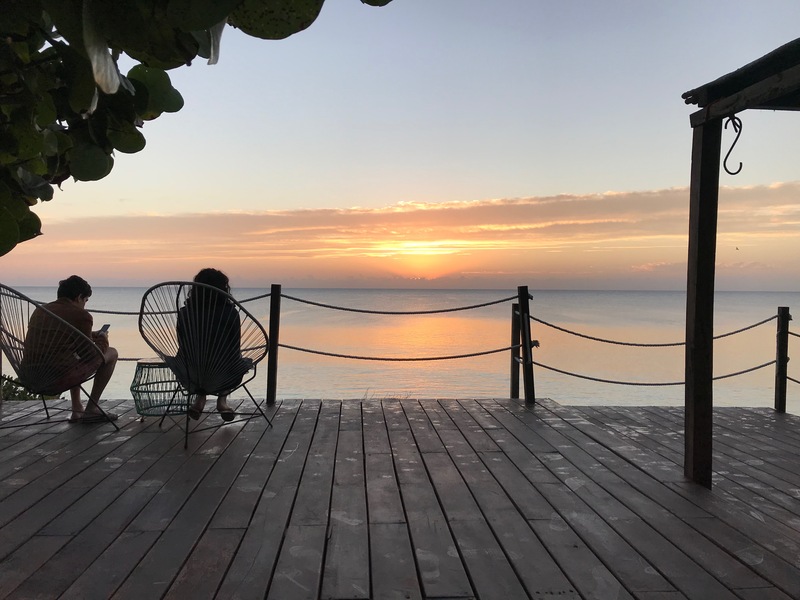 Many times over the years, we’ve watched the moon rise out of sea from their outdoor tables, while enjoying delicious wood-fired pizzas and grilled fish from their menu. 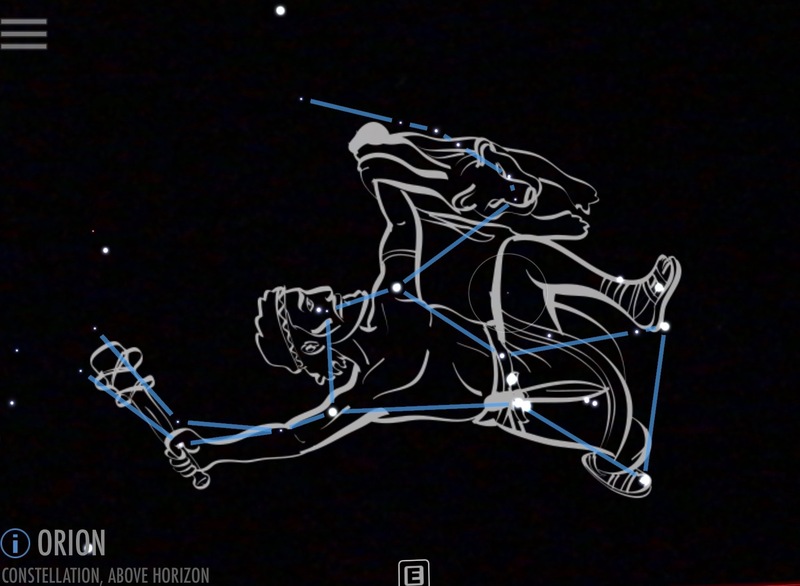 In November, the sky is often crystal clear in the evening. From Maria del Mar’s deck on the sea, we saw numerous shooting stars and watched the Orion’s Belt constellation rising above the sea. It’s a reminder to us that we are on a wondrous, revolving planet. 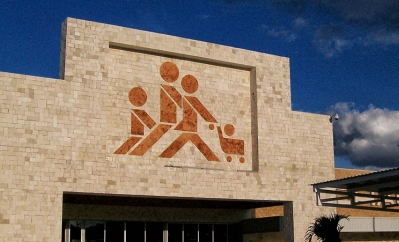 10) Chedraui — It sounds silly, but we often stop in at Chedraui, a big box store similar to Walmart, when we’re passing on the road to Tulum Pueblo. It has several cash machines, the most affordable pharmacy in town, sunblock, a mind-boggling array of peppers and hot sauce, plus a great selection of Mexican craft beer, and so much more. Tulum is developing— some would say quickly, but as New Yorkers, we have a different concept of what rapid development means. We’re wondering how many more years we’ll be able to bike along the two-lane beach road. It will be difficult to expand the road beyond two lanes, with properties rising on both sides of it. But we haven’t seen any level of development that makes us not want to return next year. 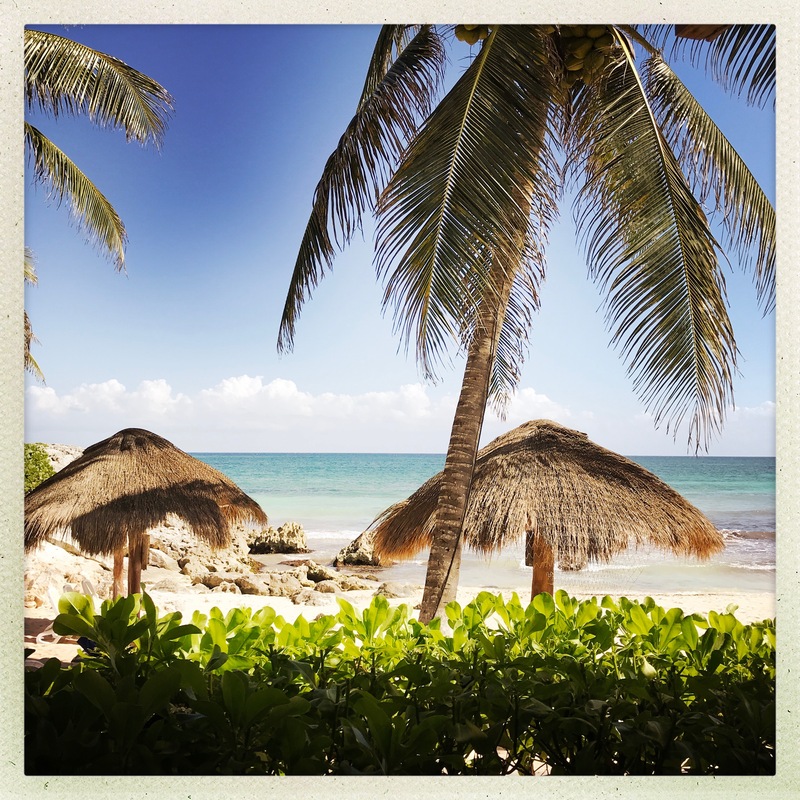 As we always say when we leave Tulum, Hasta la proxima. We’re already dreaming of the next visit. *We were not compensated for anything in this post and all opinions are our own. All photos our own unless credited otherwise. See below for more images from our 10th visit. 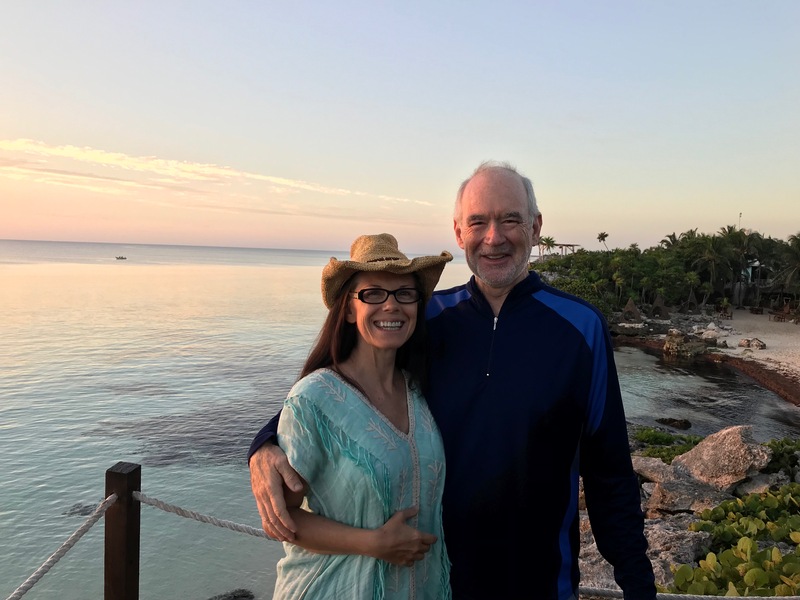 Thank you for sharing … My wife and I live permanently in Playa and have visited all the places you speak of and we have to agree with everything you say …Thanks for let those out there know that México is a warm gracious and beautiful country and it is now our Home . are huge fans of Mexico, the Yucatán and elsewhere! 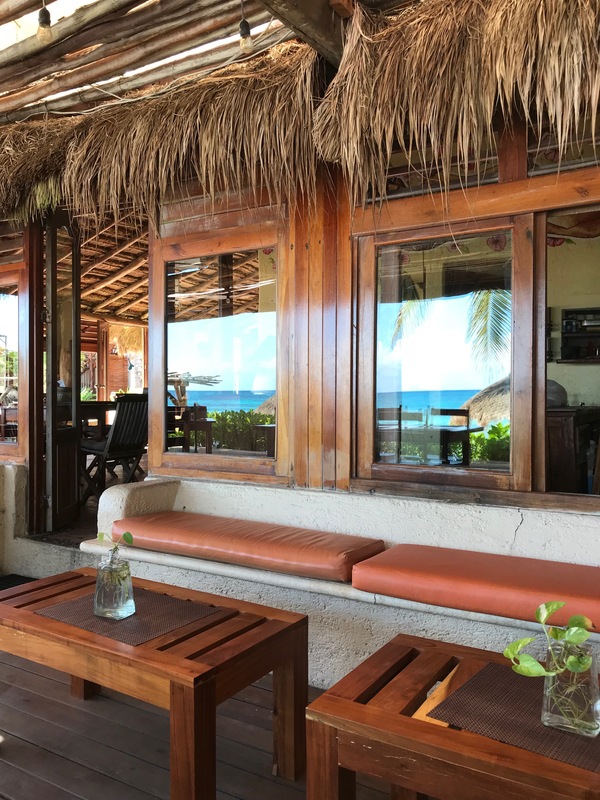 Ona, we can see what you love about Rosa del Viento—That beach, the food, and wonderful service. Enjoy your April visit!